This is a big deal, so GET EXCITED! A well run rewards program can have a HUGE positive impact on your corporate culture, so make sure your managers understand how important this is. Be clear with your goals and message. Outline what you want your program to accomplish and how you will measure your progress. Incorporate peer-to-peer recognition. 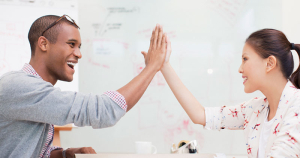 Being recognized for positive behavior by your fellow co-workers can be more powerful than being recognized by your manager, so be sure to use both. 1 This is a big deal, so GET EXCITED! 2 Be clear with your goals and your message. It’s an awesome feeling, when your manager recognizes that you’re doing a good job or giving extra effort. But it can be even more rewarding when your co-workers are the ones recognizing you! The best rewards programs incorporate positive recognition from both managers and co-workers. However, co-worker recognition takes some finesse; you don’t want to encourage a “quid pro quo” system where co-workers plan out a way to vote for each other, and you don’t want it to become a popularity contest where everybody’s favorite person wins repeatedly. We see it work best when the manager gives out most of the recognition rewards, and the peer-to-peer recognition portion is set up as a reoccurring survey of who has done the most to help their team of co-workers in that past month or past quarter. Have your managers conduct a quick survey of their employees to see who is giving the most extra effort; drop names in a hat, ask each person for their vote, or use a one-on-one email for a reply from each person on the team. Then reward that month’s MVP, as chosen by their peers – or do it quarterly and reward the top First, Second and Third Place MVPs for the quarter!